It’s true what they say: sometimes you can get more bang for your buck. That’s particularly true in an incredibly large and diverse country like the United States, where relative values of currency and commodities can vary wildly from region to region. While there are a ton of factors that actually go into determining what something is or is not worth, most people are generally only concerned with how far the money in their pocket will actually get them. Thanks to some digging and calculations done by the folks over at the Tax Foundation, we have a little more insight into the topic. 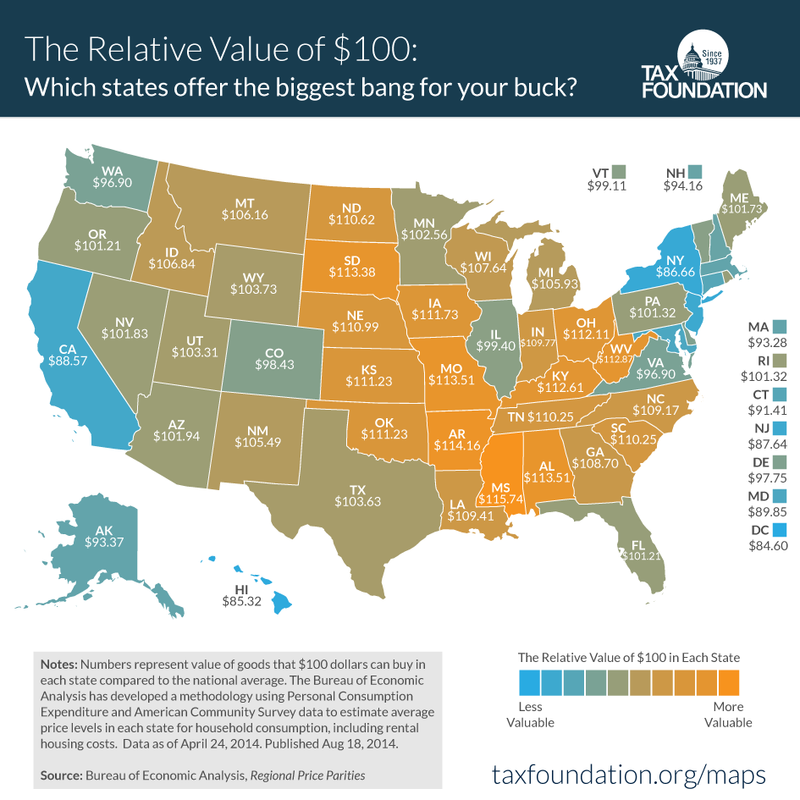 Using data collected from the Bureau of Economic Analysis, the Tax Foundation published an infographic containing a map of the United States, along with the relative value of $100 in each of the 50 states. The results may not be all that surprising, as it reveals that your money is worth quite a bit less in states like Hawaii, Alaska, and California than it might be in places like Ohio or Kentucky. Naturally, urban areas tend to be much more expensive than rural regions. A look at more data from the Tax Foundation indicates that many of the urban settings in states like New Jersey and California have much lower relative values for currency than in parts of The Great Plains, for example. Some of the reasons for the large rift boil down to simple economics from a supply and demand perspective. For example, Honolulu is the most expensive city in the country to live in, mostly because it’s densely populated, has incredible weather, and lots of people want to live there — also, it’s an island. Since demand is high and supply of housing and jobs is limited, and transportation to and from the island is expensive, prices increase. A quick look at the numbers presented shows that the value of $100 can vary quite wildly from as low as $84.60 in Washington D.C. all the way up to more than $115. That’s a difference of nearly 30 percent, simply based on location. What states get you the most bang for your Benjamins? Read on to find out. It’s a good time to be in South Dakota. Not only will your money go a long way — $100 has a relative value of $113.38 — but the economy is looking up as well. The state is jumping on the growth bandwagon along with its neighbor North Dakota, which is seeing heaping piles of revenue stream in from production jumps in natural gas and crude oil. Not only that, but South Dakota also does not have a state income tax for individuals, meaning residents get to keep even more of their hard-earned money. The only two areas in the state where cash loses a bit in value is in the Black Hills region and around Sioux Falls, according to the Tax Foundation’s maps and data. The great southern stronghold of Alabama offers a relatively low cost of living and increased value on currency for residents. Within the state’s borders, $100 has a relative value of $113.51, good for one of the best figures in the nation. Alabama is, however, one of the more impoverished states in the country as well, which plays a big factor. Goods and services tend to be cheaper so that residents can afford them. Every one of Alabama’s neighbors is also above the $100 threshold in relative value, a good indicator of what type of socio-economic makeup of the region. For visitors to Alabama, expect your money to get you a little further. Tied with Alabama, Missouri also has the advantage of a $113.51 relative value for a crisp $100. Also like Alabama, all of Missouri’s adjacent states — with the exception of Illinois — also come up well above $100 in relative value. But the drop from Missouri to Illinois is quite steep, around a 14 percent drop in relative value just by crossing the state border. Of course, that’s not necessarily how things pan out, as Chicago plays the biggest factor in Illinois’ ranking. Regardless, Missouri residents do get the advantage of some extra value from their money, which undoubtedly helps millions of people across the state. The second best state in terms of bang for your buck is ‘the Natural State’ itself, Arkansas. Arkansans enjoy the benefit of a more than 14 percent boost to their dollar value, with $100 being relatively equal to $114.16. The only two regions of the state that see the dollar’s value lose a bit of power are in Fayetteville and Little Rock, two of Arkansas’ more populous areas. The economy in Arkansas is improving overall as well, with unemployment figures flirting with 6 percent and lower in some cities. To get the absolute most for your money, one needs to travel south to Mississippi. According to the Tax Foundation’s data map, the relative value of $100 in Mississippi is $115.74, a nearly 16 percent increase to the value of every dollar. The state lacks any major cities and giant metro areas, although it does have a handful of relatively big cities. The rural setting sets up for a low cost of living, and its location close to the Gulf of Mexico makes for cheaper fuel prices as well. The state is still struggling with a high unemployment rate — between seven and eight percent — so the further residents can stretch every dollar, the better. Kings of Retail: Can Amazon Knock Wal-Mart off its Throne?